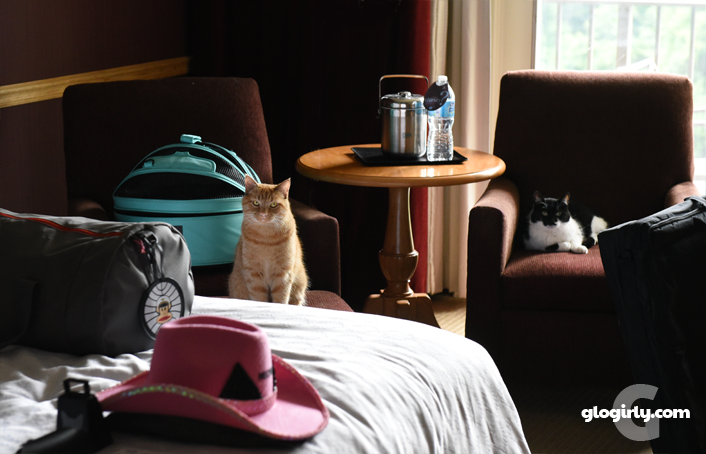 WAFFLES: They're going WHERE without us??? KATIE: The Waffle House. For breakfast. Pretty sure they're going to eat WAFFLES too. KATIE: Maybe even CHICKEN & waffles. Of course, Glogirly had to make a special stop. And there were plenty of takers who were up for a ride-along. What's the Waffle House without Waffles? 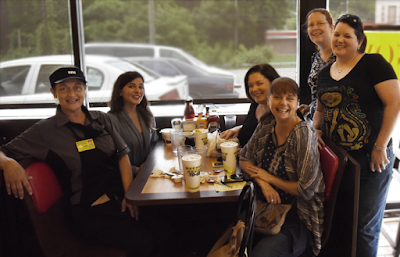 The highlight of breakfast was Sonia, our super sweet server with a smile as big as Texas. ... or in this case, Nashville. She made our Waffle House adventure complete. And even sent us on our way with Waffle House hats, mugs and plenty of caffeine for the road. Stay tuned...we're not done yet! We'll be back tomorrow with the latest in our On the Road with Waffles & Katie: Nashville series. Day Four: Do You Smell Something? Day Five: A Public Katie Sighting??? I was so happy to see you all at BlogPaws and to actually meet Katie. You were so nice to have a Kitty Cocktail party and to say nice things to The Mountain people about me. Hugs. Mom Paula stopped at the Waffle House for breakfast on the way out, too! It was so good to see Glogirly. She hated she missed seeing Katie (she saw a quick glimpse of Waffles before he headed under the bed). What an awesome place to stop, too bad ya didn't get to go too Waffles. My human is envious! She wishes she could have been there - it looks like the Waffles House - oops, I mean, Waffle-singular House excursion was lots of fun! Glad y'all had a great time in The South! Waffles and Katie, did they bring you any samples to try? Gasp! Waffles for breakfast.........that is not only wrong that is inhumane! Someone needs to root glogirly! 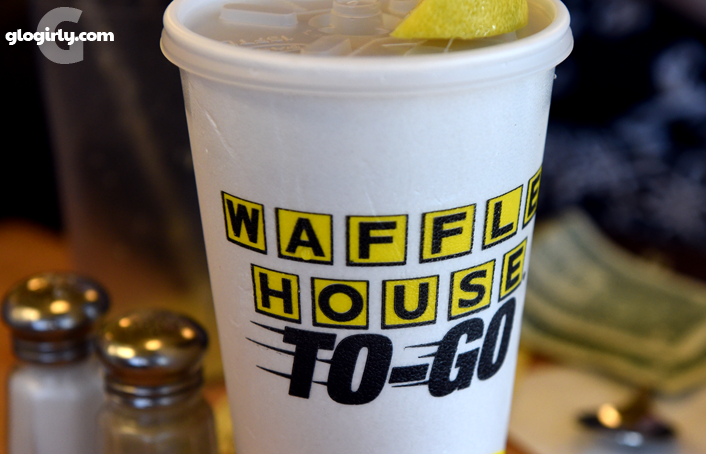 We have to admit the Woman thinks of you every time she sees a Waffle House (and there are lots of them here). And also when she passes Chicken King. She's sure that Waffles has his Charlotte home there. Ha!!!! Best ever!!!!! What fun and you lucked out by scoring such a great server!! Bet she was ecstatic! Waffles, here's hoping they had pancakes! And brought you some chicken! 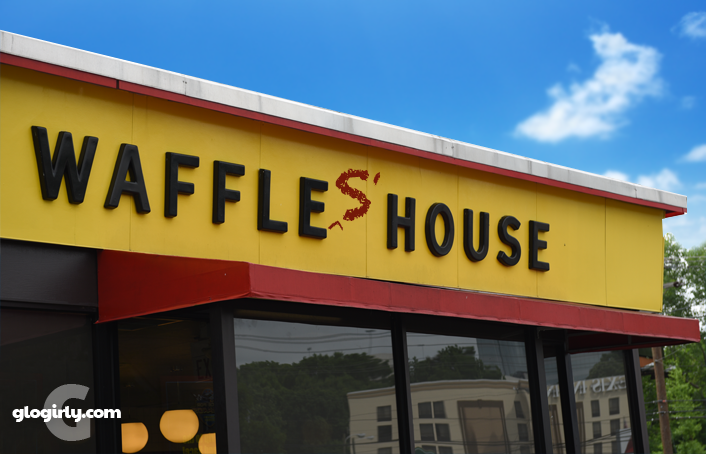 Waffle house without Waffles? Shocking! 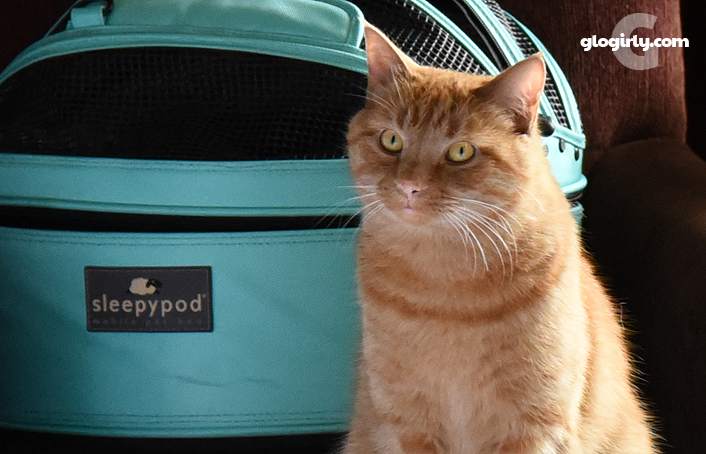 We hope you have a good ride home and that Gloman gets his cat and girl fix soon! Nice to see so many of you together. That sounds like a grand adventure!!! What a road trip and you're all troupers! I have just caught up on all your adventures, and it sounds like you all had a great time. Shouldn't that be Waffles Chicken & Waffles House???? What a perfect stop. We had no idea that Glogirly had never been to a Waffle House! We're glad to hear that you -- well all of you except Katie and Waffles -- had such a special adventure before you headed home to your Waffle Houseless homeland. This has been the road trip to end ALL road trips! We've had so much fun "riding" along. Safe travels Waffles, Katie and Glogirly! We is so sorry you didn't get to go to your house Waffles...that sounds just not fair to us. 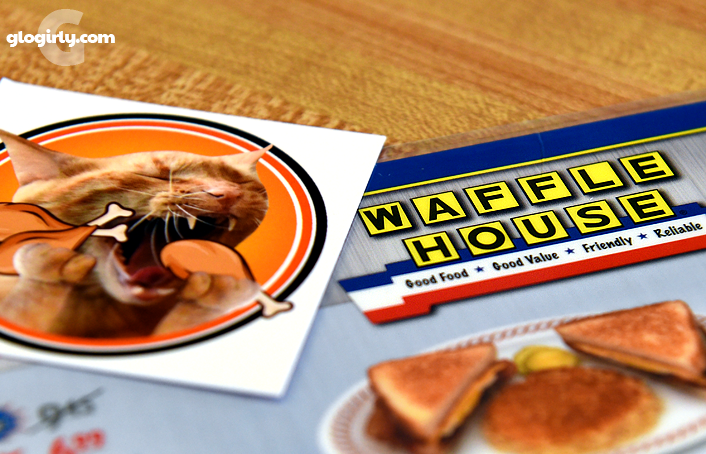 Do you get royalties on the Waffle House? Hope you are home safely and that Gloman is happy to see you all. Waffles, there's a place near us named after you -- it's called Waffle Shop. The Waffle House is great! Too bad Waffles didn't get to go and sample some chicken. Looks like everyone, people and paws both, had a great time. Hurry home - the weather is perfect here. Love the Waffle House server - I'll bet she's a cat person. TW went to Waffle House twice. Actually two different ones since she’s been to the one in GA when she kinda lived there. They have the best waffles. Did you see the “Casa de Waffles” hot sauce? TW took a pic of it. We have Waffle House here too in Canada! Those are great pics!